Over the past week I had the opportunity to attend the International Student Conference on the Environment and Sustainability at Tongji University in Shanghai. Organized by UNEP and Tongji’s Institute of Environment for Sustainable Development, the goal of the conference was to provide an international platform to connect passionate students, researchers, policymakers and industry leaders from around the world who are actively engaged in finding solutions to the environmental and social challenges that threaten global sustainability. 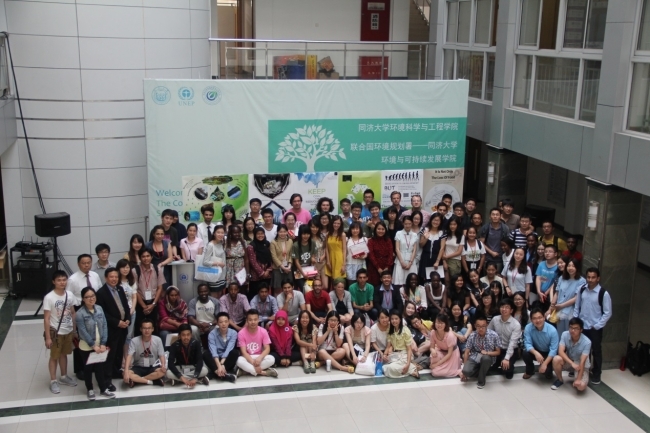 Out of thousands of applicants, around 400 students from 47 countries were brought together under the theme of “Ecological Civilization and Green Development”. The first two days we attended a variety of panels and discussions held by speakers that ranged from international leaders to community-based practitioners, as well as students who have contributed outstanding research on energy transition and climate change. We also heard from Tongji University Professor Zhang Xu, who introduced the results of a recent study on ‘Improving the Rural Energy Efficiency in China based on Evolution by Game Theory’. To summarize, in rural areas throughout China farmers often burned straw biomass directly in their fields, which not only added to pollution and caused a lot smoke and a strong smell, but was also a waste because it could be used as an energy source if it could be delivered to local power plants. Rather than forcing the farmers not to burn the straw, or asking them to deliver their straw to the power plants for compensation (which would have been too inconvenient for too little compensation), he used game theory to develop a ‘middle man’ principle – a middle man could collect the straw from many different families to deliver to the power plant, and he generated a compensation model that would equally balance the supply and demand between the various actors. We also heard from green tech innovators like Florian Bohnert, who helped start My CO2, an international company that develops tech solutions for measuring and communicating environmental information, like ‘smart metering’ and visualizations of consumption data, to promote and enable end-user energy efficiency. The final two days students joined one of four subgroups: Sustainable Education, Food and Health, Ecosystem and Climate Change, and Green Development based on our current research projects and interests, and shared how we are fighting in our local communities, as well as at the national and international levels, for the shift to sustainable, socially just environmental practices, policies, and technologies. Some of the outstanding student projects included Kennedy Liti Mbeva’s research on affordable and renewable energy supplies like locally-assembled solar panels and interventions like Clean Energy Cookstoves in rural Kenya, and Sarabeth Brockley’s research on the fracturing of rural communities as a result of hydrofracking activity and the growing presence of natural gas companies in the northeastern US. The final day each group presented a summary of the challenges and opportunities discussed with strategies and recommendations on how best to continue forward. Within the context of the US and China’s back-to-back commitments to reduce CO2 emissions of power plants (the US to cut power plant carbon emissions 30% by 2030, and China to set a cap in the next 2016 5-year plan), it was inspiring to meet so many of the people who are engaged on the ground, pushing for these types of breakthroughs in climate negotiations and developing the technologies that are making the transition to renewables a reality. At the same time, there was an overwhelming sense of urgency that time is running out. From the unstoppable collapse of the West Antarctic Ice Sheet to worsening heat waves, droughts, wildfires, torrential rains and other extreme weather events, it is clear that catastrophic climate changes are already occurring and individual changes in behavior and consumption habits, while necessary, are no longer enough to keep us below the tipping points because the real culprits – the fossil fuel companies – have five times as much carbon in their reserves as it would take to destroy the planet, and as the richest and most powerful industries on Earth they intend to burn it unless we pressure our governments to step in, stop subsidizing them, and start leading us in this transition. Collective action at the local level is critical to set the world on a fundamentally new course. On September 20th and 21st UN Secretary-General Ban Ki-moon has invited world leaders to convene in New York for a Climate Summit to catalyze action by governments, business, finance, industry, and civil society on climate change prior to the UNFCCC goal to reach a global climate agreement in 2015. This will be a pivotal moment to demand decisive action because the 2015 Paris talks are our last chance to come to an internationally binding agreement that could keep global warming below 2 degrees celsius and avoid an irreversible path of climate disaster. Climate change is the biggest crisis our civilization has ever faced, and I encourage you to join the September 21st Global Day of Action. The key to understanding exists at the nexus where self-interest and practice meet power and policy; I explore this nexus through participatory field research. This entry was posted in Conferences and tagged climate change, environment, UNFCCC. Bookmark the permalink.